Despite the fact that laptops are getting lighter and more portable day by day, using them in bed is still a nuisance. 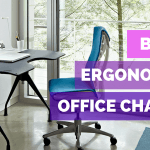 The constant weight of the device on your lap coupled with the heat generated can be uncomfortable, while the restrictive seating position is an ergonomic nightmare. Moreover, keeping your device in your lap can potentially restrict airflow and cause damage to it. 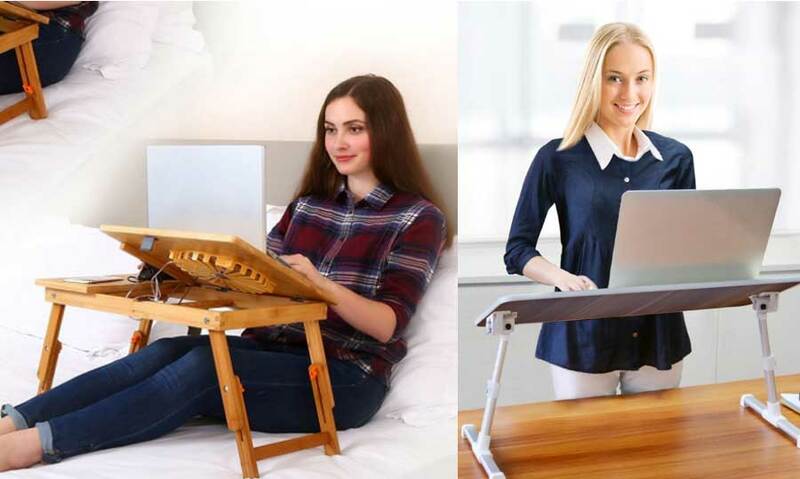 To remedy this situation, we have compiled this guide of the best Laptop tables and trays primarily for use in bed to make sure the continuous sitting does not take its toll on you or your device. Our panel of experts reviewed a number of products before deciding on the best laptop tables for use in bed. Each product brings a unique set of features to the table (get it?) so you are bound to find the optimal desk that caters to your specific needs. Hopefully, at the end this guide, you would be able to decide on a desk that would make working in your bed a part more pleasant experience. Is a laptop Tray or Table really necessary for working in bed? 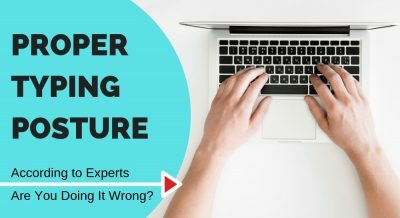 Does it affect the laptop’s performance? 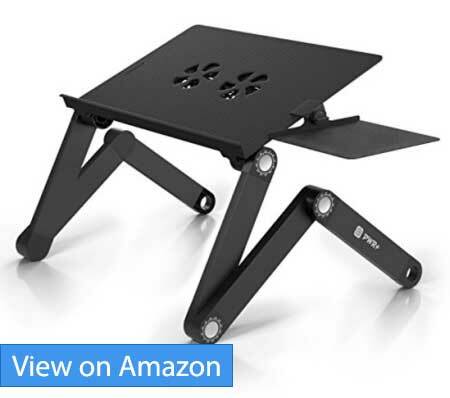 We start with Avantree College’s adjustable laptop table, one of the sturdiest products we tested in this list. Right out of the box, the table is striking to look at with its sleek, modern design. The use of high quality materials was also noticeable during the simple assembly process. The table features a wide base that can easily support larger laptops up to 17 inches. The desktop can tilt up to 30 degrees with a simple locking mechanism to keep it in place so you can keep your laptop at the optimal viewing angle. Small protruding plastic tabs prevent the laptop from slipping the table. The table also features adjustable legs with a simple tab mechanism to adjust height. The legs have a wide base to enhance stability but still manage to be foldable under the surface which, along with its light weight, makes this table remarkably portable. The soft rubber edge around the entire desk is also a nice touch. Available in a choice of subtle beige or a flashy American cherry, this was also one of the more pricey tables we tested. That said, the use of quality material and sound ergonomic design along with excellent customer reviews makes it an investment worth making. Pwr+ brings a very strong contender to the fray with a futuristic design and strong emphasis on ergonomics. Their portable laptop design features all aluminium construction and a high level of adjustability for optimal ergonomics. The futuristic design makes this table a pleasure to look at. It features three joints that can be rotated 360 degrees simply at a press of a button. Releasing the button then locks the joint securely in place. The high degree of movement means it can be adjusted to all manner of positions, heights and angles that best suit your requirements. In addition to this, it also features a built in mouse pad attached to the side and angled level to the main table for ergonomic use. Dual fans powered by your laptop’s usb port are built in to prevent heat build-up. All in all, this desk is ideal for the discerning user. However, the three adjustable joints setup can prove finicky for some users to set up with some users reporting stability problems. However, considering the 2 year warranty, ability to support large 17 inch laptops and great ergonomics, this table is definitely a prime contender in our list. In stark contrast to the sleek Avantree desk, the Winsome follows a more traditional design language with its solid wood construction. It is also one of the most economical tables in our list. The bed tray comes ready to use and already assembled out of the box. The wood construction gives it a very solid feel but does mean it is quite a bit heftier than the competition. The top flips and locks into one of the four available incline settings allowing you to adjust it to a comfortable angle for easy typing and viewing. A small drawer on the side allows you to store small objects like your mouse or pens. A prominent shortcoming of this tray is the lack of adjustable legs. As pointed out by a few customers, the lower static height can mean larger users will have trouble fitting this desk over their legs. That said, the legs can be folded away under the table for easy transportation. All in all, Winsome’s solid wood desk is an excellent budget product with solid construction. 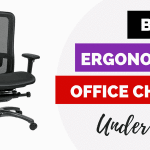 The lack of height adjustability means it doesn’t score as well in ergonomic design and some customers also report quality control issues with scratches and loose parts. That said, with an overall solid customer rating, this bed tray is one of the best if you are on a budget. 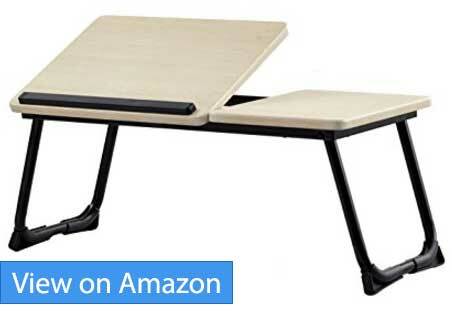 iMounTEK portable laptop table brings a full featured desk to the mix at a very reasonable price. With its hard plastic construction and two tilting surfaces for both your mouse and laptop, it is a definite contender for the best laptop desk. The table immediately checks the ergonomic design box with its dual tilting surfaces and height adjustable legs with two height options. 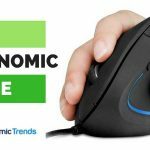 You have the option of keeping the mouse pad level on one surface while keeping the laptop tilted at an optimal angle, preventing build-up of strain in the wrist. Moreover, the table also features a built in fan to keep your laptop cool as well as an LED light to light up your keyboard should it not have a back light. It also features 4 usb ports to allow you to easily charge devices independent of your laptop. Lastly, a small storage compartment is also included to stow away small items. However, the split surfaces mean that this table can only accommodate smaller laptops up to 13 inches. The solid construction and on-board electronics also means it is a tad heavier than the competition. Some users also report quality problems with the electronics and the hard plastic lacks a premium feel. However, a very respectable rating on its Amazon page and a one year warranty make this definitely product worth considering. 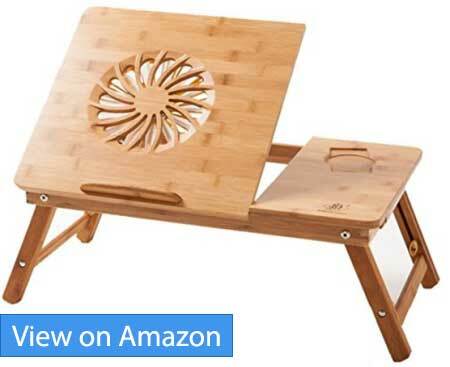 Nnewvante brings a unique offering to the laptop desk niche with its Bamboo laptop tray. Finished in natural bamboo, this tray offers great features in an attractive design at a very reasonable price. Right out of the box, the tray feels very solid to hold and requires no assembly other than unfolding the legs. The natural bamboo construction feels wonderful and looks great in its natural brown color. The tray features a single tilting surface with 5 tilt settings up to a maximum of 45 degrees which is ideal for working on your bed while propped up against a pillow. 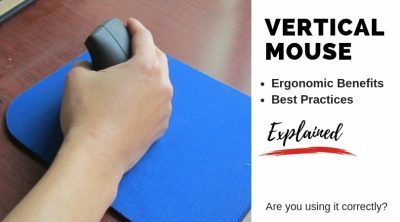 Moreover, the right quarter of the tray remains level to let you use your mouse without any awkward wrist angles, and also features indentations for your cellphone and coffee mug. 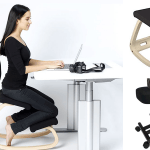 The height can be adjusted from the minimum 8.8 inches up to 12.9 inches thanks to the adaptable legs. The tray also features a fan to keep your laptop cool by simply plugging the provided cable into your laptop’s usb port. A conveniently places drawer provides easy storage for small items. That said, it does struggle to accommodate larger 17 inch laptops despite stating support for them. A few users also complained about a malodorous smell upon opening the package. 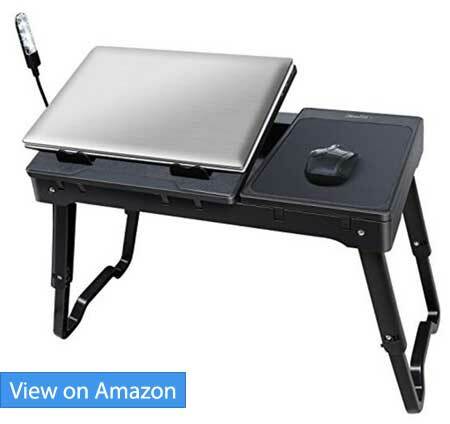 However, with its solid construction, reasonable price alongside a one year warranty and good set of features, this tray is definitely worth considering if you want something unique for your work. GreenForest’s sleek laptop tray is one of the best looking one we have reviewed with its minimalist modern design. It also does an excellent job of holding your laptop at a comfortable position for optimal viewing. The desk requires no assembly; simply unfold the legs and it is ready for use. The folding legs and light weight construction make it remarkably easy to carry around. 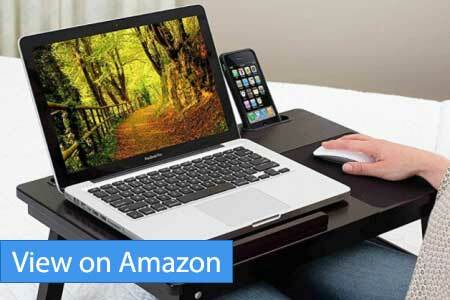 The laptop tray is made of MDF and features nicely rounded corners for a very pleasant design. The main portion of the tray can be tilted and locked in four different positions with the side portion remaining level for your mouse or coffee cup. The overall dimensions are quite good and it can accommodate a 17 inch laptop with ease. That said, the stylish minimalist design means this tray does skimp out on features. The legs are not height adjustable although the 11 inch height should be sufficient for most use cases. Moreover, it lacks any storage drawers and fans, features found in most laptop tables and trays at this price points. However, if light weight, an attractive modern design and portability are your concerns, then GreenForest’s offering is definitely worth a look. SofiaSam’s laptop table is an ideal table for those who like to multitask and use a variety of devices in bed. With its bamboo construction and choice of three colors, it is also one of the more attractive tables we reviewed. The table requires no assembly and is usable right out of the box after unfolding the legs. The most noticeable thing immediately is the size of the table. With its large surface, it can easily accommodate large 18 inch laptops. Moreover, it features a level surface to the side with a mouse pad already built in. The highlight of this laptop table has to be dedicated slots from your tablet and phone, tilting them at an optimal angle for use in bed. Moreover, the main table can tilt to easily adjust your viewing angle. The lack of height adjustability is noticeable but the 9.25 inch height should be suitable for most users. A reasonably large storage box is also included which is actually quite usable, although some users have reported it to be quite loose and sliding opening if the table is tilted. 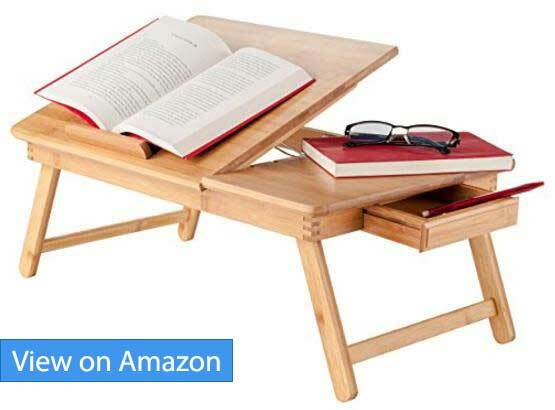 All in all, the table is especially useful if tend to use a tablet alongside you laptop. The materials and finish is quite good, but the large size means it isn’t the most portable table in this segment. Some users have also reported receiving the product with scratches on the surface. However, if you need a large, multifunctional table, then this is the ideal product for you. Lacks features like height adjustment and cooling fan. With a similar highly adjustable design like Pwr+’s table, Furinno gives you a wider variety of colors at a lower price. 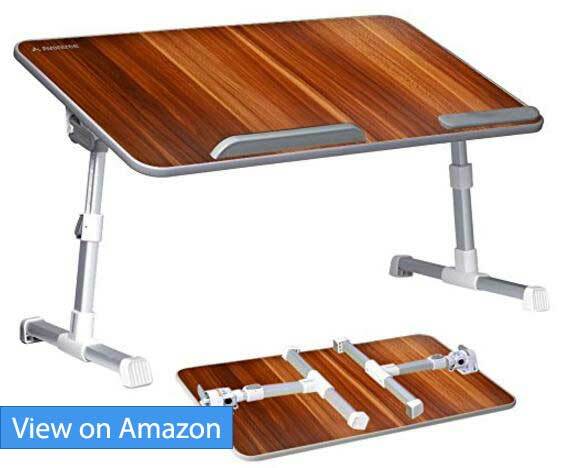 While it skimps on some features, it is still a great option for anyone looking for a highly adjustable laptop desk for use in bed. Like the Pwr+, Furinno’s table comes with three 360 degree rotating joints that can be easily adjusted in all manner of positions for optimal comfort. The table comes with cooling holes for airflow and is available is remarkable choice of 11 colors. It also features a lower price albeit no mouse pad, although a model with fans is available. All in all, the solid metal construction and ergonomic design make this a worthy adversary to most of the tables we reviewed. That said, some customers have reported durability issues which explains the slightly lower rating than the Pwr+ table. However, given the price point and overall positive reviews, this table is a definite winner with its ergonomic design. If you work on your laptop in bed, a laptop table is highly recommended. Using a laptop on your lap isn’t ideal, causing constant strain on your neck and eyes due to abnormal viewing angles. Moreover, laptops tend to get quite hot which can be uncomfortable and some studies even point reproductive abnormalities due to radiation output#. Ergonomic laptop desks prevent these to a high degree for a safer, more comfortable experience. This is highly dependent on your requirements from your desk. If you plan to use it for your tablet or as a breakfast table, you will have to go for a large model with slots like the SofiSam’s multitasking table. If you have back issues and need a highly ergonomic table, choose Pwr+’s offering. All in all, this depends on your use case as well the device you plan to use the table for as well as your budget and aesthetic requirements. It does! A harder surface provides better airflow as there is a smaller chance of the air vents getting blocked. Morever, most tables also come with fans or ventilation holes. This allows your laptop to run cooler preserving its performance. Again, this depends on your use case. If you use a mouse with a heavy, gaming laptop with high heat output, a large rugged table with a fan and mouse pad is ideal. For smaller laptops, you can choose a lighter, more ergonomic design that also offers portability. Or if you don’t use your laptop for extended periods, choose a budget option that offers only the basics. 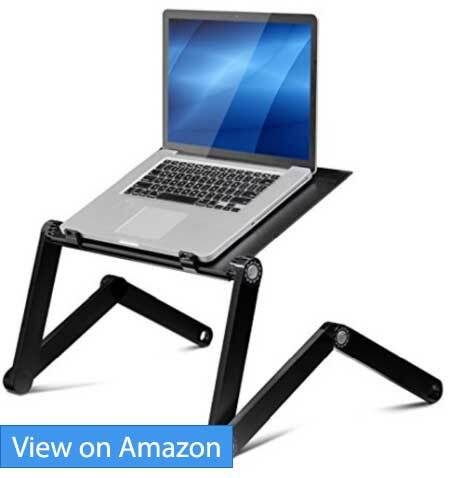 To conclude, a laptop table for use in bed can offer a large number of advantages at quite a reasonable price. It allows you to use your laptop from the comfort of your bed without any of the problems associated with postures, eyestrain and radiation output that can lead to significant discomfort over time. 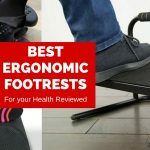 This guide reviewed a large variety of products each with a different set of strong features that is bound to resonate with you and help you choose the best laptop table for use in bed.